On December 20, 2018, the final Conference of the project "Public budgets from A to Z" was held, where the partner organizations presented their activities during the last 2 years. The results of the component "Strengthening the participation of vulnerable groups (women, youth, national minorities, people with disabilities and youth) in the budgeting process" was presented by expert of the PAUCI Foundation - Roman Shirokih. Problems of the target group, which can be solved through the local budget. The results of the survey indicate that the main source of information about the project and implementation of the local budgets are the local authorities web sites. 16 out of 34 polled organizations are involved in the budget discussion during public hearings, and a third of polled organizations indicated that the discussion was initiated by local council members. It is worth noting that social networks' potential is almost not used. Only 2 organizations called social networks as a source of information about the local budget project. The survey also shows that employment is the main problem that can be addressed by the local budget and is common to most target groups. Starting own business is the most important issue for women. At that time, representatives of national minorities and people with disabilities focused on the implementation of cultural projects. The next step was to conduct meetings with representatives of the city local authorities and civil society organizations, under the facilitation of PAUCI Foundation experts - Denis Chernikov and Natalia Baldych. Meetings resulted in recommendations regarding the changes in budget legislation and the best practices of communities in the field of public involvement in the budget process. The final meeting in Kyiv, using World Café methodology took place on October 11, 2018. This event gathered participants of the previous meetings, representatives of the central government authorities and CSOs from other regions. CSO participation in the formation and execution of social order. Participants jointly investigated obstacles, best practices, factors of success and formulated proposals for improvement in the 4 stages of the budget cycle and participation of CSOs in the execution of the social order. To get the list of proposals for improving of the budget process, follow the link. For more information about the component, please click here. 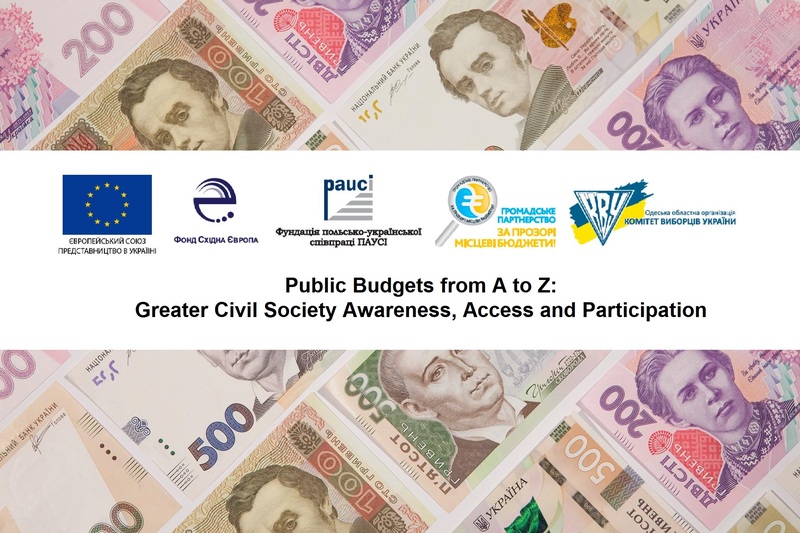 The Project “Public budgets from A to Z: greater civil society awareness, access and participation” is being implemented (2016-2018) by East Europe Foundation and the Polish-Ukrainian Cooperation Foundation PAUCI funded by the European Union.